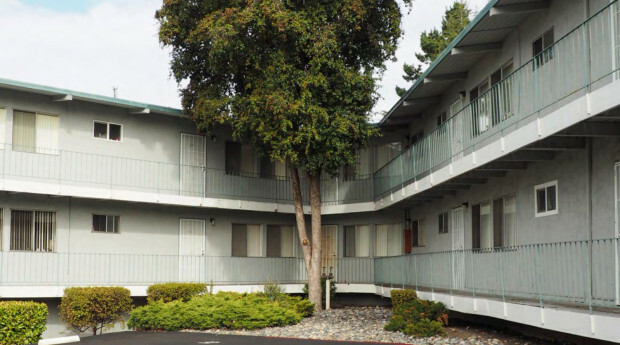 Irvine, CA, February 13, 2018 – Last week, Integrity Housing and Tablerock Capital finalized the purchase of Manchester apartments in San Leandro, CA. The 44-unit property, located at 1919 Manchester Road, features 18 affordable homes reserved for low income individuals and families earning up to 60 percent of the area median income (AMI), and 26 market-rate homes. The property joins Integrity’s portfolio of investment properties which are both environmentally-friendly and affordable. Manchester has 16 one-bedroom, 27 two-bedroom, and one three-bedroom units. The community features laundry facilities, a central leasing office, and a resident courtyard. Units include ceiling fans, a balcony or patio, walk-in closets, fully-equipped kitchens, and exposed beams. The transit-oriented development is located one mile from a Bay Area Rapid Transit (BART) station, and nine bus lines serve the neighborhood. It is also close to numerous interstates, and popular shopping and entertainment districts. Tablerock Capital sought out Integrity Housing as a non-profit partner to purchase Manchester. Tablerock Capital owns and manages affordable properties in Nevada. Manchester is Tablerock’s first purchase in California. Integrity and Tablerock purchased the property at a below-market price, due to an expedited timeline and the non-performance of a previous buyer.